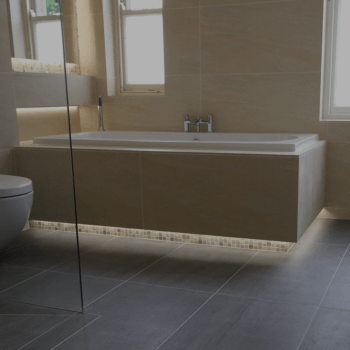 We are experts in bathrooms and specialise in the design, fitting and tiling of beautiful, bespoke bathrooms in Harrogate, Leeds and across Yorkshire. Whether it’s small or large, contemporary or modern, we’ve got it covered! We also specialise in wet rooms and smaller cloakrooms. We have over 15 years experience and we offer the very highest quality bathroom design, fitting and tiling. We can also get you huge savings on top brands. 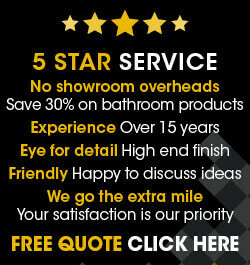 We are the bathroom fitting professionals and can offer expert advice and deliver the highest quality finish. Our bathroom fitters are the best in the business, and our work will take your breath away. We’re also expert tilers, so you can rest assured that we can deliver the whole project from start to finish. The bathroom is an important part of family life. It needs to be functional and efficient. But, why can’t it be beautiful too? Why not turn it into a space that you’re proud to show off to family, friends and neighbours? It can still be functional and efficient but it can also feature beautiful aesthetics, ergonomic design and high-quality materials. It should also be your sanctuary and a place where you can relax and unwind, and withdraw from the stresses of everyday life. We can give you expert advice on materials and design. We are approachable and friendly and pride ourselves on the standard of our service and our expert knowledge. If you have your own ideas you’d like to bring to life we can help you develop them further to bring your dream bathroom to life! With over 15 years of experience fitting bathrooms and tiling, we really are the best in the business. But, don’t take our word for it – check out some of the people who have been blown away by our bathroom fitting skills. Whether you want marble, mosaic, slate or travertine, PRD Ceramics can design and install your perfect bathroom. We can source and install the best fixtures and fittings (at the best price) and your tiling will be pristine. Get in touch with PRD Ceramics for a free, no obligation quote today.